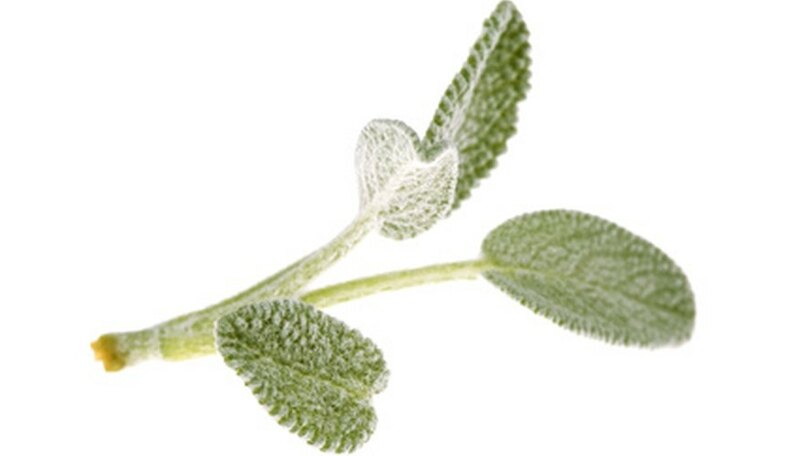 Sage is an evergreen perennial sub-shrub that produces fragrant leaves and flowers. Sage plants grow best in full sunlight and in well drained soil. Pruning is essential for healthy and productive plants. Prune after sage has flowered or when its begin to lose its shape. Sage is prone to spider mites and aphids; usually beneficial garden insects take care of the problem, but you can use horticultural soap to get rid of the pests. Slow-growing white sage, sometimes called bee sage, takes up to three years to reach maturity. White sage may spread 8 feet or more, grows 2 to 5 feet tall, and produces a flower wand that adds another 2 to 5 feet of height. Flowers are tiny and white with dots of lavender and bloom from late April until early June. Leaves are gray-green, stems are brittle and break easily. White sage grows best in full sun and dry soil conditions and will die if the ground becomes too wet. Bees are attracted to the fragrant flowers and leaves of the white sage. Leaves are often used in incense and for medicinal purposes. The bright red tubular flowers of the pineapple sage are attractive to hummingbirds. Named for it's pineapple-like fragrance, the pineapple sage grows to be 2 to 3 feet in height and 3 feet in diameter. The plant prefers full to partial sun and dry soil, but needs regular watering. Pineapple sage is a fast-growing plant with bright green leaves and red blooms that appear in late summer or early fall. It is used as a fresh, edible flower and is added to salads, iced teas or used as garnish. Pineapple sage is perennial to U.S. Department of Agriculture Plant Hardiness Zone 8. Where temperatures dip below 25 degrees F, it can be grown as an annual. Cleveland Sage will stand 3 to 4 feet tall and up to 8 feet in diameter when mature. They are drought resistant and are considered a good choice for naturalizing larger areas. The Cleveland sage, sometimes called blue sage, has dark gray-green leaves and produces a fragrant blue flower for five to six weeks beginning in late April. The plant prefers full sun, well-drained soil conditions and regular watering. The shrubs make good homes for birds and attract butterflies and hummingbirds. Cleveland sage is used in potpourri and makes sweet-scented dried flowers. Hardy cherry sage grows 3 to 4 feet tall, with a spread of 4 feet. Cherry sage prefers full sun and well-drained soil, though it prefers to be kept moist. The plant has bright green leaves and produces dark pink, crimson or purple flowers that bloom in mid-to-late spring and continue blooming throughout the summer and into the autumn. Flowers are fragrant, attract hummingbirds and are used to make potpourri as well as edible garnishes.